Police in southern Russia are investigating allegations of animal cruelty after a donkey was made to parasail as part of an advertising stunt, Russian media report. 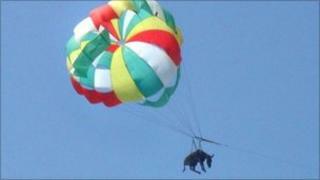 The donkey was sent up into the sky last week by entrepreneurs hoping to attract people to their private beach. Witnesses near the beach on the Sea of Azov in the Krasnodar region said the animal had been screaming in fear. It landed in the water and was pulled onto the shore, said police. Instead, bystanders took photos and phoned newspapers, she said. "It was put up so high into the sky that the children on the beach cried and asked their parents: 'Why did they tie a doggy to a parachute?'" Taman newspaper reported last week. "The donkey landed in an atrocious manner: it was dragged several metres along the water, after which the animal was pulled out half-alive onto the shore," the paper reported. Police began to investigate after the incident, which occurred at the coastal village of Golubitskaya, was aired on national news on Tuesday. The businessmen responsible may face criminal charges for animal cruelty, according to news agency RIA-Novosti. The stunt was condemned by the Brooke equine welfare charity, whose president is the Duchess of Cornwall. "The Brooke is appalled at the cruel and irresponsible behaviour of the people behind this 'advertising' campaign," said Kimberly Wells, an equine welfare advisor. "There was clearly no thought for this animal's welfare before they strapped it into a parachute, sending it catapulting into the sky. "This animal would have been extremely distressed, suffering immeasurable fear and pain. This should never have happened."